SHREDDER is the last novel in the Crusher trilogy, and we're pleased to have Niall Leonard stop by to tell us more about it. Niall, what was your inspiration for writing SHREDDER? Shredder was the culmination of a trilogy that started with Crusher. I suppose the driving idea for this part of the story was of one guy caught between two or three unstoppable forces and how with wits and courage he manages to play one off against the other. The last scene was the hardest to write for reasons that will become apparent to the reader. But at the same time it had a poetic rightness to it. Any of Lee Child's Jack Reacher novels, I think. Though his are a little longer than mine and my hero is less convinced of his own rightness. How long did you work on SHREDDER? It took about six months to write but a year or two to plot out and daydream before that. That when you put your imagination to work there are no limits on what you can depict. What do you hope readers will take away from SHREDDER? Funny you should ask that question - I just cleared out the attic of my old house and found a few copies of the first book I ever wrote, finished when I was 20 years old. It never got published, and for that I am extremely grateful - not because it's bad (though it's not very good) but because it's gushingly autobiographical. When I first started writing professionally it was for TV because I'm good at dialogue, and good at taking notes from producers and making script changes quickly and efficiently. All the same I got a bit of a reputation after a while for being 'difficult' because I got more and more frustrated at the compromises I had to make and the way my ideas got mangled to fit the demands of television. After all that pressure, writing a novel was amazingly liberating - no-one messes with your work or tells you to do it differently. Sometimes your editor might make a suggestion, but they never change anything without your permission. Many people know I wrote the first novel of this trilogy, Crusher, in about a month. What's less well known is that I had been plotting it on and off for about three years before I finally set pen to paper. If you've planned your story properly it's not such a challenge to write it quickly. That said, every author has their own approach. They key to writing a novel is to sit down and write the blasted thing. If you wait for an AHA! moment you may be waiting the rest of your life. Aha moments come from focusing for ages on the problems of your story until you come up with an answer - from hard work, in other words. Inspiration is for poets - unpublished ones. I never listen to music, it's too distracting. I usually work at my desk but sometimes the temptations of the Internet and email are too great - then I go work longhand in the kitchen, or very rarely to a café. I like to write trickier scenes out in longhand, where I can tear out pages and crumple them up and throw them away in anger like a proper author. Then when the scene is in a shape I like I put it onto a PC and carry on working. I try to set myself a quota of words or scenes each day, and to get to the end of that one way or another. A quote I read this morning from Steven King, which goes something like 'talent is cheaper than table salt - what separates the talented individual from the successful is a lot of hard work'. In other words, talent ain't enough - don't count on it to get you where you want to be. I am finishing off a period detective novel based on a genuine historical character so amazing nobody will believe he existed. In the gut-wrenching third and final novel in Niall Leonard’s Crusher series, Finn Maguire is lured back into the warring factions of the underworld by way of blackmail. Finn “Crusher” Maguire has one simple task: to set up a meeting. But when that meeting is between the Guvnor and the Turk, two psychotic criminals vying for control of London’s underworld, Finn’s task proves to be anything but simple. As the city cracks under a blistering heatwave and the UK is rocked by a series of terrorist outrages, Crusher finds himself caught up in a gang war full of carnage, corruption and treachery. To save himself and the girl he loves from being shredded to a bloody pulp between opposing factions, Finn faces horrifying risks and impossible choices. Niall Leonard grew up in Newry, Northern Ireland. In 1977 he attended the University of York to study English, and from there went on to The UK National Film and Television School where he trained as a screenwriter and director. His first film was Absolution, an old-fashioned revenge thriller with a supernatural twist, filmed on location in Newry in 1983 and starring Derek Halligan. Niall returned to Newry In 1985 to shoot locations for his graduation movie, the black comedy No Man’s Land, starring Patrick Bergin and Des McAleer. After graduating from the NFTS in 1986 Niall’s first broadcast work as director was the comedy series Phil and Arthur Go Off for Channel Four, followed by stints on ITV’s long-running cop show The Bill. Meanwhile Niall pursued his own projects, writing and directing the one-off black comedy Rotten Apples starring BJ Hogg and Ian McElhinney, and developing Over The Wild Frontier, a six-part comedy drama set on the Irish border, for Channel Four. Niall’s first TV script to be broadcast on the network was an episode of Jimmy Nail’s cop show Spender, closely followed by Pie In The Sky with Richard Griffiths. In 1994 Niall took up a year-long contract as a Script Editor at BBC Northern Ireland, where he got to work with his long-time hero Graham Reid on Life After Life and made the acquaintance of Belfast’s Hole In The Wall Gang. His work as script associate on their pilot for Give My Head Peace led to a partnership that continued for ten years, with Niall contributing to every episode of the immensely successful satirical sitcom and its spinoff stage productions. In 1995 he returned to full-time writing with a script for the groundbreaking Irish comedy drama Ballykissangel and went on to create episodes of Silent Witness, Hornblower, Sea of Souls, Second Sight, and Holby City. Niall adapted the Minette Walters thriller The Dark Room for BBC1, and wrote numerous episodes over several series of Monarch of The Glen, Wire In The Blood and Wild At Heart. Recently Niall completed screenplays for two big-budget two-part thrillers for US cable TV, loosely adapted from novels by Alastair Maclean. Air Force One is Down started shooting on location in Luxembourg in May 2012, with Puppet On A Chain slated to go into production later the same year. As part of the 2011 Nanowrimo novel-writing event Niall wrote Crusher, a gritty crime thriller set in London featuring Finn Maguire, a dyslexic young offender investigating the murder of his father. The novel was picked up by Random House for publication in October 2012, and Niall is currently working on its sequel. Niall has led seminars and workshops on screenwriting and script editing for the BBC, the Northern Ireland Film Council and the Irish Screenwriters’ Guild, and lectured on the creative process at the University of Reading. He is married with two kids and a rather smelly dog and lives in West London. 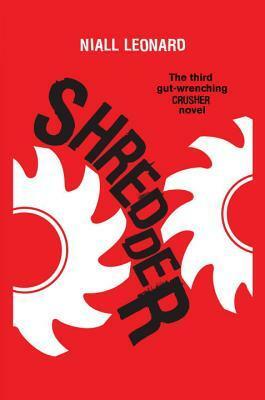 What did you think of our interview with Niall Leonard, author of SHREDDER? Let us know in the comments!